Saturday dawned slowly – a grey overcast day with some quite heavy rain through the night. We were woken by the church bells at 8.00, the time we had agreed to have breakfast. Susan was suffering a sore throat (from having to do too much talking at her work annual conference, I suspect), but neither of us were feeling any effects from the accident the day before. After breakfast we drove through Preuilly-sur-Claise to la Roche-Posay. We had checked out the house from the outside on Friday, and had arranged to pick up the keys in the afternoon, so we didn't stop. The market in Preuilly-sur-Claise looks to be very small and has only three or four stalls, which is a bit disappointing. We went into la Roche Posay to do some sightseeing. It was just as busy as last time, but with the added attraction of a music festival. While we were there we took the opportunity to refill our water bottles with the local brew, which issues from a tap in the wall of the spa. It tastes OK, not really much in there when you consider how good it is supposed to be for you. It must be said however, that not only has the spilt water from the fountain turned the footpath black, it is also eating it away. Susan likes it though, so that's a saving on mineral water when we move to France. We then drove on to Poitiers to exchange the car. It was raining really heavily in places, and misty in other places, with periods of bright sunshine. The Hertz agency was where I remembered it to be (opposite the station), but not where the lady on the phone from Hertz indicated it was. This meant we arrived at ten minutes into the lunch-hour and had to come back in two hours. This gave us an opportunity to check out the underground car-parks of Poitiers (and also the market and restaurants). The market looks extremely good, if not as picturesque as the market in Loches. Poitiers itself has been marked down as somewhere else to be explored more fully at some stage. The new car was a Renault Megane six speed diesel. Why six gears when I rarely remember to use fifth? We arrived at the Immobilier's in Preuilly to pick up the key to the house, where we realised that I had managed to leave the tape measure in the overhead storage unit in the Kangoo. Susan had wanted to measure the garden so she could start planning the vegetable plots. It doesnt really matter, because I can pace out a metre quite well. When we got to the house (and after struggling with the 8 barrel lock on the front door) we were amazed to see how much junk has been cleared out. The floor in the front room was clear for the first time, and it is obvious that we will be retaining the tiles in there. They appear in great condition and will be a big feature of the house when we are finished. Unfortunately (once again) I forgot to take photos, so that is one for the next visit. While we were at the very top of the stairs we found proof that there are bats – they were flying around our head. Not very many, and we don't mind sharing some space with them as long as we can keep them (and the evidence of them) out of the house. Overall, the house still appears to be in not too bad a condition once we can get the roof sorted out. 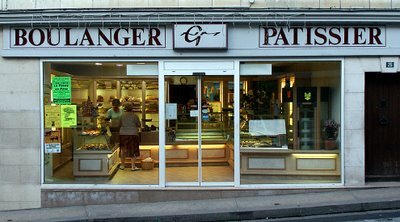 After inspection the house one or two of our party (that would be Pat and Geoff then) were gagging for a cup of tea, so we went to La Roche Posay again, via Boussay this time. Cups of tea and coffee were located easily, and then thought turned to dinner. After a stroll around Roche Posay's restaurants (which all appear at first glance to be slightly disappointing) we decided to try le Promenade in Yzeures-sur-Creuse, which appears in the ever reliable Routard. 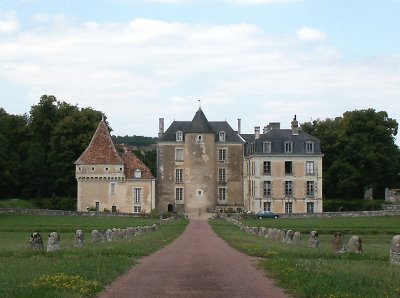 If that turned out to be either too expensive or not appealing we would return to Roche Posay. What a great find! We had the 20euro menu, 3 courses which offered amongst other things Charentais melon (with or without ham) or homemade terrine as entree, pork with grapes and butternut squash mash (really good, even though pumpkin is cattle food) or fish for main, and either crème caramel or fresh fruit of the season for desert. This restaurant is quite brilliant, the ingredients fresh and interesting and all put together in really imaginative but tasty combinations. We will be returning here. Well! What a weekend we have had. So much action I've decided to split the weekend into days. The day we signed the Compromis we decided that we would return in about 6 weeks to just give things a bit of a push along. This time we invited my uncle and aunt (who live in London) to come with us so they could in turn give a rapturous report to my parents. We book into Tours (Loire Valley Airport) and out of Poitiers flying with Ryanair. No more 5 hour drive around Paris!! Pat and Geoff picked us up at 7.00 because we were a bit concerned about traffic on the M25 (London's circular parking lot) and wanted to get to the airport nice and early. Geoff isn't a fan of take off, so needs a seat next to Pat. We were first in line at the Ryanair queuing system (something designed to take the last remaining vestiges of romance out of travel), so we were able to get exit row seats. I don't like Ryanair much, but they do fly to where we need to go. We arrived at Tours almost on time, and while Susan and the others were getting our checked luggage (due to the ridiculous cabin luggage laws at the moment we had to do it) I picked up the car. It was a nice new Renault Kangoo in metallic red, just perfect for the 4 of us and our gear. Because the car pick up procedure was so quick, I was able to be at the pick up area by the time they emerged. This was a good thing, because it was raining, and continued to rain on and off for the next 36 hours. Unfortunately, we do not have a picture of the car, because 15Km after picking it up we were driving along a winding country road a woman driving towards us decided that the piece of road I was on looked better than where she should have been. She gave us a smack in the back drivers side door, causing quite a dent (and breaking the hub cap cover). She was travelling fast enough to continue along our side of the road and damage the car behind us too. Susan sorted out the paperwork (which was surprisingly easy) while I had a little sit down – I could hear the words being said, but even when people were speaking English they made no sense. Unlike in England,(where it appears obligatory to leave the cars strewn across the road while you have an argument), in France every vehicle carries a crash report form which everyone completes then signs, and the work is done. Because ours was a hire car, however, we had to return the car to the agency and replace it. This we achieved on Saturday afternoon, after trying unsuccessfully a couple of times, and having made a bundle of phone calls. 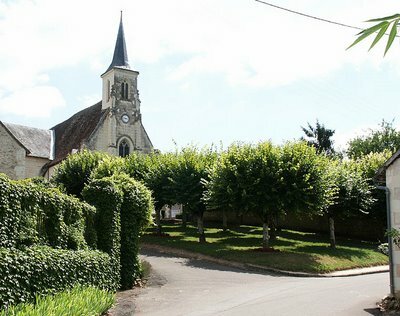 We were booked into a hotel in Le Grand Pressigny because our usual hotel is closed for their annual holidays. We checked in, made a reservation for dinner, then had a stroll around town. 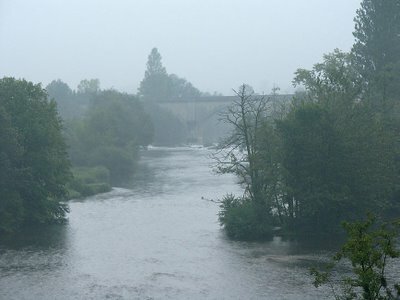 The rain was light enough not to be a worry, so we wandered down to the river (the Aigronne, a tributary of the Claise) and stood in the shelter of the lavoire, the reconstructed ancient public laundry house. We watched the river (very therapeutic) and looked for wildlife before strolling in the mist around the vegetable gardens and up to the chateau. From there, we arrived back at the hotel just in time for dinner. A nice relaxed meal (home made terrine, stuffed chicken leg, followed by chocolate mousse, with rather a nice half bottle of Rose) and I was ready to sleep the sleep of the just. Having eventually agreed on a price for the property, the next step was to sign a compromis de vente. This is a binding document which sets out the conditions of the sale, including things like a get-out clause in case finance or building permission falls through. Once the is signed however, you can't be gazumped. One suspects that the sudden burst of activity around agreeing a price wore the agent out, because despite regular emails from us, they appeared to be having a nice lie down and couldn't respond. We suggested a date for signing, which passed, and we wrote saying that we needed agreement on a date at least two weeks in advance because of the cost of travelling increasing. This eventually produced a response. (I'm still not sure that the agent doesn't think that we're still living in Australia and were travelling to France from there). Eventually we agreed a date, and then I booked our tickets. I also emailed Credit Agricole in Tours (because that is where their English speaking branch is) to arrange an appointment to open an account. Because the agent had left it too late for us to do otherwise, we could only get flights in through Charles de Gaulle. Again. This time, after consulting Tripadvisor, I decided we would try the Francillien, route N104/ A104, which although it was designed by the authorities to do just the trip we wanted, refuses to appear on any of the routefinders. I also showed I had learned from previous mistakes by booking a Formule 1 (motel) in Blois. On the Underground to Heathrow I had a worrying though - that I had left the back door not not only unlocked but open. Unfortunately, I then spent the whole weekend worrying. (I hadn't, it must be an old man thing). The whole trip went amazingly well, however, as we ate at the airport before leaving London, thus removing the pressure of finding somewhere to eat after all the restaurants along the Motorway had closed. Even the traffic was not too bad on the new route, it appears to go mainly through countryside. We didn't even miss any direction signs. We arrived in Preuilly about 10.00am Saturday, but the market looked a bit poor. This may be because there was the annual Preuilly Brocante Vide-Greniers (literally; attic clearance sale) and everyone was elsewhere. If it isn't the case, it means we will have to travel to Loches market, which will be no hardship at all. The Brocante Vide-Greniers was pretty dire - so much stuff, so little of it attractive, useful, or working. Everybody did appear to be enjoying their lunch, however. We, on the other hand, had bought a baguette, some ham and various salad bits and had a picnic by the river. Susan was delighted to see that the insect life there was buzzing (there's a pun there somewhere, I can't be bothered looking for it though). As we had plenty of time to spare (we weren't meeting the agent until 5.00pm) we went for a drive around the immediate area. How lucky are we to have all this on our doorstep? We then visited Bossay-sur-Claise, which has a pretty park (complete with a concrete table tennis table) where the tiger moths and damselflies were busy, much to Susan's delight. We also visited Domaine de Ris, which at only 4km (21/2 miles) from Preuilly is our nearest winery. We were really pleased to find that the wine is really good quality, and very reasonably priced. Another win! We hurried back to Preuilly, to find that the immobilier was not at the office. We sat and waited in the Post Office car park (quite nice, actually) a while, then I rang her. The answering machine was on. Then we started to wonder if we were meant to be meeting at the Notaire's, so I drove there to check. It was closed. When I returned, the Immobilier had arrived and was going through documents with Susan. Apparently no comment or apology had been made for her lack of punctuality. I guess being on time is very Anglo and therefore something we will have to work on changing. 30 Minutes later, cash was exchanged and Susan is one step closer to owning French property. For dinner that evening Susan took me to our local Michelin star restaurant, la Promenade. owned and run by Jacky Dallais (you can read the reviews here). What a brilliant evening. Just over 100€ for a meal that stretched time (and waistbands) in a beautifully refined environment. Although we will not be going there often, we will be returning, there is no doubt. Quite a perfect gift. The next morning I was up early to photograph every shop in Preuilly. This was less on artistic grounds than just wanting a visual reminder of what the shops are - and where they are. The upshot is that my Google Earth has every shop marked, together with a photo and contact details. 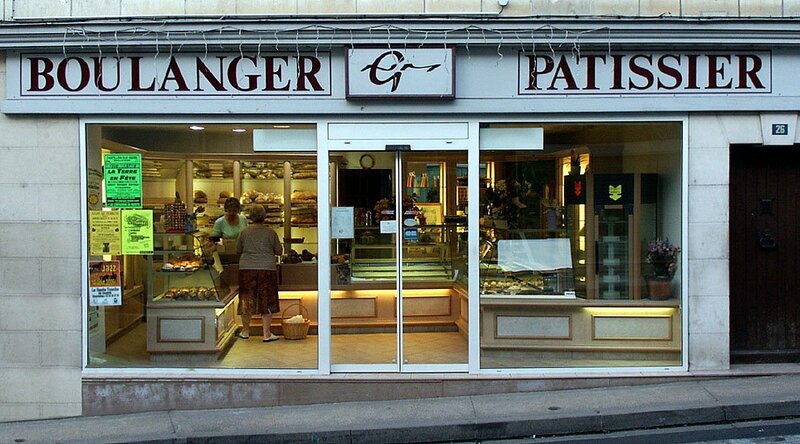 I was reminded just how different France is by the fact that there are two boulangeries in town, and even at 6.50 on a Sunday morning they were both open. As I worked up the Grand Rue, photographing all the buildings, I passed the Immobiliers. In the window was the advert for our house, with the word "VENDUE" across it. This excited me so much, I rushed back to the hotel (a marathon of about 20 metres) to tell Susan, and then drag her out of bed to see it. We then took a walk around Preuilly to see it before it woke up. 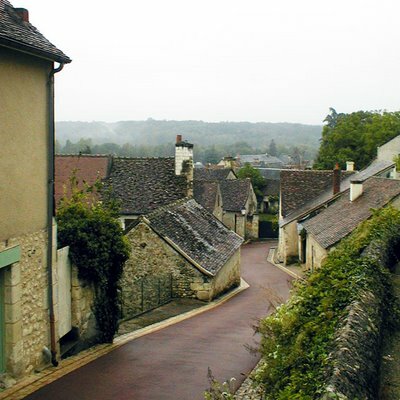 It is such a quiet town, however, that you would have trouble noticing the difference. 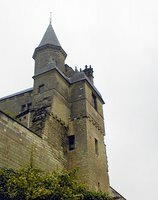 We had decided we would go to La réserve de la Haute-Touche, an open zoo run by the French museum service and located at Azay-le-Ferron, a mere 11km (7 miles) from Preuilly. We had a couple of hours before it opened so we recommenced our exploration of the local area by car, visiting Yzeures-sur-Creuse (where our nearest large supermarket is), La Roche-Posay, where we had coffee at a cafe overlooking a very busy market square, and the chateaux of Rouvray and La Guerche. I think being so close to la Roche-Posay could be really useful. It has a very famous health spa, and consequently is a more cosmopolitan town than Preuilly (but a lot busier and noisier) with cafe's, cinema, casino and a racetrack. It isn't somewhere I would want to live, but as it's only 15km (9 miles) away, close enough to visit regularly if we need a little big city feeling. The zoo at Azay-le-Ferron is really interesting - a section you drive through with various (mainly European) animals, and then a series of walks radiating out from the carpark. We ate at the restaurant, then wandered off to see the wolves. On the way we saw our first European Pond Tortoise, a native of the Brenne, Also lions, various tigers and lemurs. 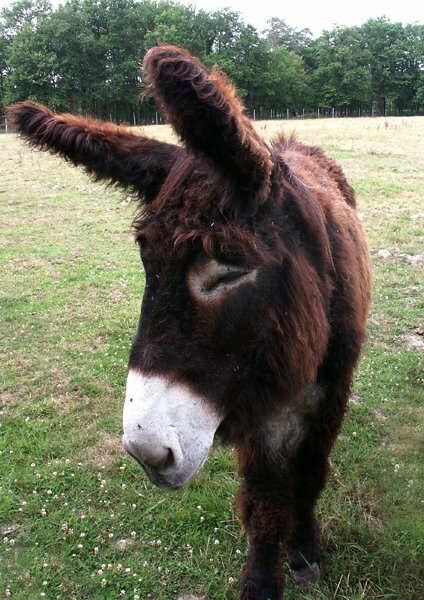 On the way out was passed a field with a Poitou donkey and it's foal. All together now: awwwwwwwwwwwwwwwww cute. We left the zoo at 3.45, giving us 6 hours to make the airport. We lost a bit of time driving around Chateauroux looking for fuel (rather than filling up on the motorway). Because we don't have any French credit or bank cards, none of the fuel pumps we found would work for us. I was starting to panic by the time we hit Paris, because time was marching on, and we appeared to be moving backwards. We arrived at the desk 2 minutes after check-in had closed, causing panic and consternation. Luckily the combination of not shouting at the man, being frequent fliers and having no checked luggage meant that he was able to open the gate, enabling us to run and catch the plane. As we were on the last fight of the day, the fact that he was so understanding saved us an awful lot of bother. It is, however, definitely the last time we fly via Paris. We were seated separately on the plane, being the last two to check in on a full flight. When we arrived at Heathrow there was no gate for us, and a bus had to be provided to carry us the last 100 metres. As Susan was near the front of the plane she was on the first bus. As I was near the back, I had to wait almost 20 minutes before another bus arrived. Luckily, we made train connections OK, and caught a cab from Dagenham East Station to be home by 1.00am. Having found a house we thought we wanted, it was time to crank that part of the brain marked "sensible" into action Susan rang the surveyor Gerard Ball and arranged for him to contact the agent and arrange a time to do the inspection. As usual with the immobilier, many messages were left on the answering machine and many emails sent, but no reply was forthcoming. Eventually (on Thursday morning) we received a call from Gerard to say he had managed to call the agent during the 15 minutes that week he was in the office and had arranged an inspection for that Friday. We were sort of expecting this, (or hoping for it) and had planned for the possibility of a quick trip - our bags were packed, we just didn't know when we were going to be using them. I rang Ryanair and booked 2 tickets from Stanstead to Poitiers leaving the same day, and coming back on Friday. (Make note to self; avoid doing this - it is VERY expensive). I also booked a car, locked the door, and ran for the train. We arrived in Poitiers on time (hooray!) 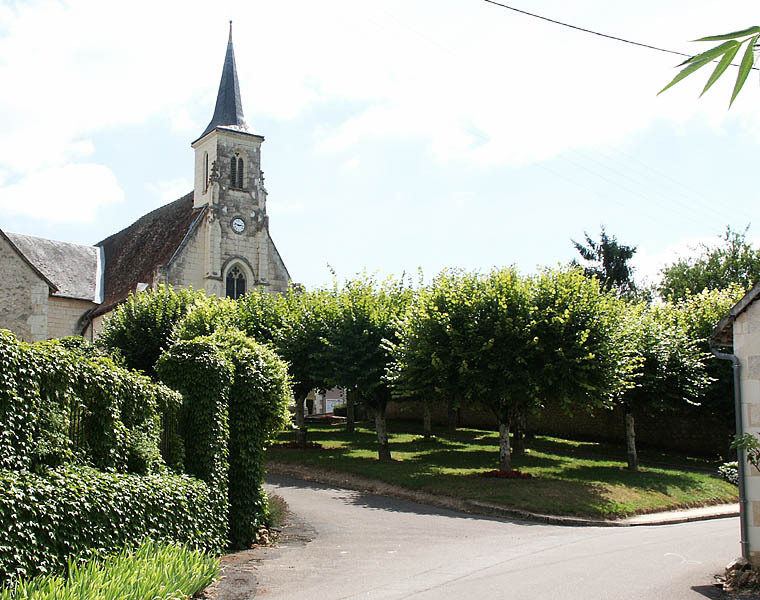 and an hour later, after a drive through beautiful rolling countryside and woodlands we were in Preuilly-sur-Claise. This is a so much better way of travelling to that part of France, more relaxing, usually no more expensive, and you save almost a day of driving. After dinner at our hotel (the Auberge St Nicolas) we went for a walk in the dusk. The evening was pleasantly warm, and we were delighted to discover that there is a colony of bats that live around the chateau. The laneway next to the chateau is one of those narrow roads where the trees either side meet to make a green tunnel, and the bats were hunting insects up and down the lane, flying close enough to make us (well - me, anyway) flinch. It reinforced the feeling that we were lucky to have discovered this town, and made us even more enthusiastic about moving there. 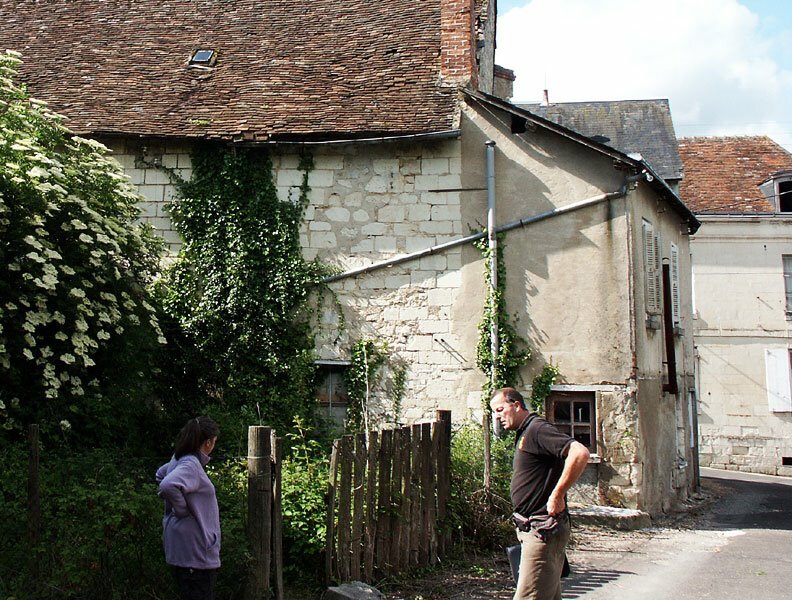 Next morning we met Gerard at the Immobilier's, and we walked to the house to have a proper look at it. It was only at this stage that I realised how jaded I had become looking at real estate, because the house was so much bigger than I remembered from the previous weekend. It was also a lot more full of junk than I remembered. Soon we were up to our necks in dust and grime, and Gerard had the tape measure out. I had been feeling off colour for the whole of the trip, and all of a sudden my stomach rebelled. This required a trip to the Public Toilets at the Hotel de Ville, which just happen to be a la turque(or as Gerard put it, "pitch and putt"). Not the place to be in an emergency. It has to be said though that for puiblic toilets, especially a la turque ones, they are exceptionally clean. The survey took about 6 hours, during which time I occupied myself with visiting the public toilets and taking photos of everything to do with the house. We also had a visit from someone we suspect may be one of the neighbourhood "characters", an elderly gentlemen who has obviously put on weight recently.The evidence for this was his trousers, which were held up by a piece of string around the waist, leaving a 3 or 4 inch gap where the fly would normally be in a pair of trousers. Luckily, his dignity was maintained by his shirt which must have been tucked into his socks............... 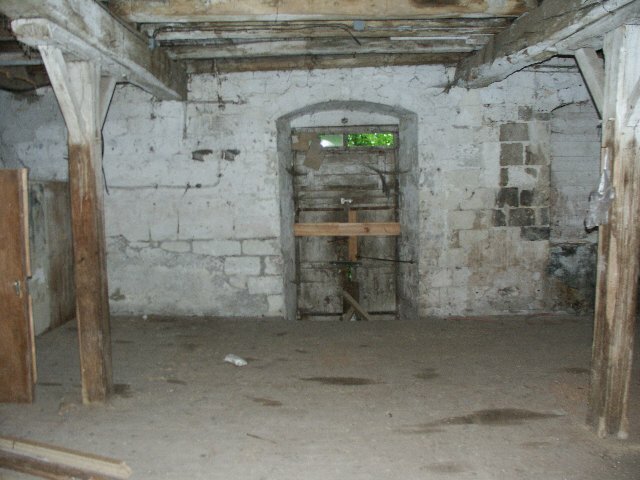 He told us that the previous owners had last lived in the house about 35 years ago, and they they had stored deux chevaux in the granary. I though he meant two horses, but Gerard took it to mean a Citroen 2CV. Either way, it was a good effort getting it/them in there, as the granary floor is almost a metre off the ground. We also met an elderly lady who lives nearby, who had arrived to cut some peony flowers from a bush growing out the back of the house. We chatted and agreed that yes, it was cold for June. It appears that most of the population of Preuilly is fairly ancient, so maybe Susan and I will be known as the "Young Australians". Time will tell. Eventually we HAD to leave Preuilly, otherwise we would have missed our very expensive flight back to Stanstead. Gerard has been brilliant in all of this. He spent ages chasing down the agent, and then spoke to the agent on our behalf when we came to make an offer. His report is exhaustive, and accompanied by a CD's worth of Photos. Although the report says that the work to be done is a lot more expensive that we expected, when it is laid out on paper the amount of work feels a lot less intimidating than it could have been. Just having the report set down in writing like it is gives me faith that we can really make this thing work. I see Simon has given me the big hint to talk about Demoiselles. Pas de probleme - I am always happy to talk about Demoiselles. Demoiselles are gorgeous fairyland creatures, irridescent, metallic, twinkling jewels of nature - not particularly uncommon, but always a pleasure to stop and watch. The area around Preuilly-sur-Claise seems to have an abundant population of all sorts of dragonflies. This is one of the reasons the area appeals to me so much. There are two species in the UK - Banded Demoiselle (Calopteryx splendens) and Beautiful Demoiselle (C virgo). Fauna Europaea tells me that France has both of these and 2 more species of Calopteryx, but I have not seen the other two. One of them rejoices under the name C haemorrhoidalis. In French, Banded Demoiselle is calopteryx eclatant (Bright Calopteryx) and the Beautiful is calopteryx vierge (Virgin Calopteryx). Eclatant can also mean 'bursting' - think chocolate eclairs - but perhaps we shouldn't go there - and I've got no idea why the other one is virginal. It seems curious that the English word for the genus is French and the French word is Greek. I suspect there is a more vernacular French name, but I have yet to come across it. 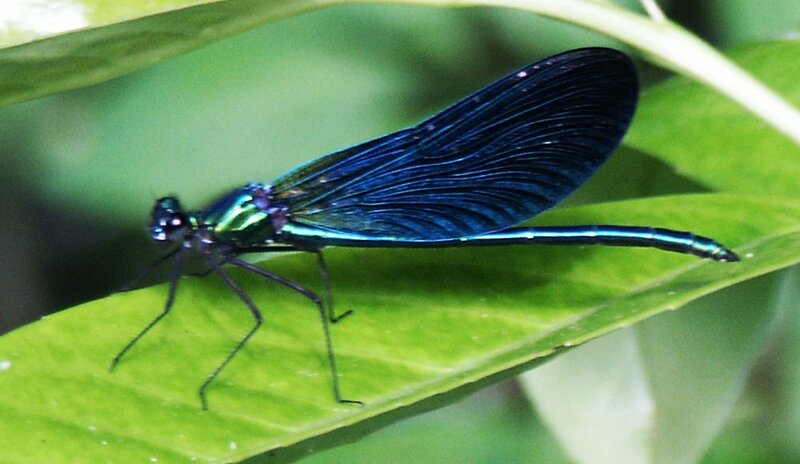 In the US, Demoiselles are apparently called Jewelwings. It is not so common to see the two species together, because they have different habitat requirements. Bandeds like slow moving water, over silt; Beautifuls need fast moving water and gravelly riverbeds - but you can see both on the river at Montrésor. Males can be told apart because Banded Demoiselles' wings are not wholly irridescent navy blue. Usually the tip is clear and the base, with the dark pigment not extending beyond the node (the little dip in the leading edge of the wing). Females are metallic green with golden yellow wings and very difficult to tell apart. A walk along the riverbank in Montrésor in July is charming. You look across the river into lovely gardens descending right to the water, and beyond them the thoroughly picturesque chateau. If you look the other way, wave after wave of swallows (hirondelles) sweep low over a water meadow like heat seeking missiles, dodging left and right at high speed, hunting flies. Something, perhaps the swallows, hunts the Demoiselles too. I found several sets of discarded (undigestable) wings on the path - all male Bandeds. Just beyond the water meadow, and having crossed over to the other side of the river, we came across a gathering of Demoiselles - mostly male Bandeds, but with some females and some male Beautifuls. The males, as usual, were fighting amongst themselves, spiralling upwards in twos or threes in choreographed posturing, and the females were lurking about much more discreetly and minding their own business. The fighting males had the perfect sunny platform of yellow waterlilies and floating waterlily leaves to stage their show. 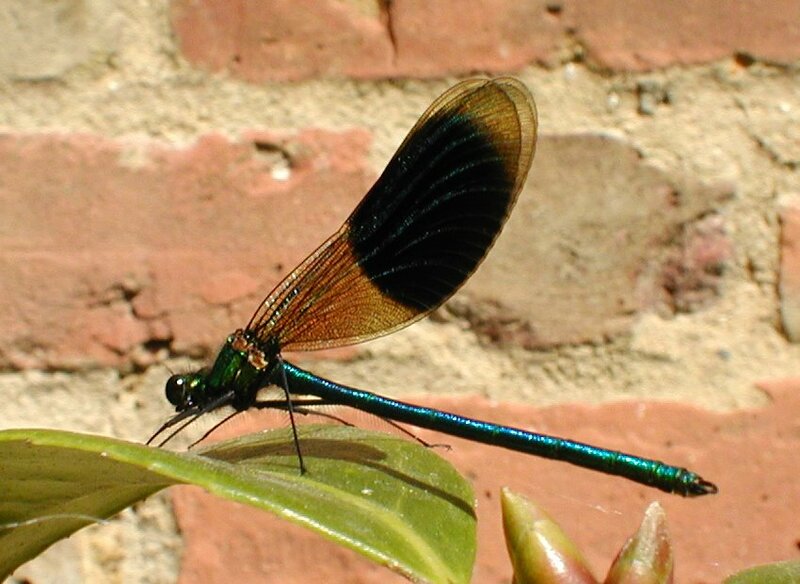 Demoiselles are a type of large damselfly and are particularly feeble and half hearted looking flyers. They generally wave all four wings about in a rather vague and unco-ordinated way and look as if it is all the most tremendous effort staying airborn, much less moving forward. (All dragonflies can, and frequently do, move all 4 wings independently). Occasionally you will see a Demoiselle making a proper effort and obviously on a mission to get somewhere, but generally you get the impression they just aren't trying (especially if you compare them to the Star Wars spaceship style of the Four-Spotted Chaser or an Emperor Dragonfly chasing an intruder off his pond). The male Demoiselle approach to flying is apparently to attract as much attention as possible from females. Like all dragonflies, you see males much more than females, because they are holding territory. The very flappy style means that a male Demoiselle glitters in a hopefully irresitable way. I have been told that some males, in their desperation to impress, will fly upstream, fling themselves upside down on to the surface of the water and float down past the females, presumably waving their little legs seductively all the while. This is an incredibly high risk strategy, as at any moment a fish may spot them, an easy meal, and pluck them off. It is believed that risk element of the behaviour is what is supposed to impress females, who are so bowled over by this reckless courage that they allow mating to occur. As soon as Susan arrived back in the UK, I started planning the next trip to France. This was going to be undertaken with military precision. 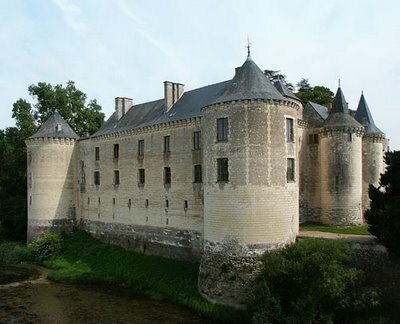 Because the fares were cheaper, I decided we would fly into Paris (for the last time) and drive to Loches. The hotel was booked for the Saturday and Sunday night, but I decided to leave the Friday night to chance, because we didnt know how far we would drive that evening. The flight arrived in Paris at 9.15pm, and by midnight we were in Blois looking for a hotel. At 2.15am we were still in Blois looking for a hotel, because of the French custom of "faire le pont" - taking the Friday off if Thursday is a public holiday. Every hotel was full. I now know the back streets of Blois like a local. We eventually found a bed in possibly the most expensive motel in town. So much for military precision, then. Saturday morning found us on the road to Loches. Once again we visited the market, which, if anything, is even busier on a Saturday than on Wednesday. Then it was time for a quiet lunch, and off to the Immobilier's for our first visit. The place we had travelled to see was an old boulangerie in Preuilly-sur-Claise. Right on the edge of the village on the main road, it was almost the first building we saw. An amazing place with many features, including the garden which had been converted into a room of over 110 square metres. That room is almost as big as the house I grew up in, which is a staggering thought. It also had a communal staircase (a stone spiral staircase possibly 500 years old) and a cellar over 1000 years old. The rooms were all higgledy piggledy, and appeared to have grown where they landed. So tempting, but at the same time a real challenge as far as what to do with all that space! It also had no garden except for about 10 metres of shared courtyard. Needless to say we were sorely tempted. We returned to Loches with the agent. 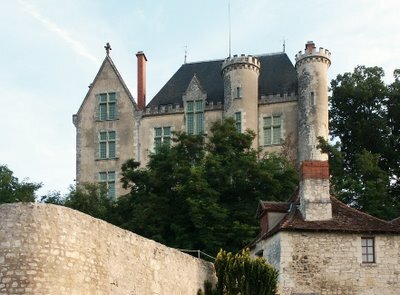 As it was still mid afternoon, we went for a drive around Loches and environs, visiting Loche sur Indrois and Montrésor. Montrésor is a beautiful village with a chateau and water meadows crossed with walks. The demoiselles were really busy (but this is Susan's field of expertise, so more of that from her). Over dinner (at the Gerbe d'Or and including, once again, the Cointreau Souffle) we made plans about what to do with the boulangerie. Sure it was a challenge, but we felt ourselves equal to it. The plan was to spend all day Sunday visiting the Brenne Nature Park and the area around Preuilly so see what was actually there. The day was rainy, so we spent a lot of it in the car talking endlessly about the boulangerie and our plans for it. Although we knew the work would be expensive we thought it might be the right place for us, lack of garden not withstanding. 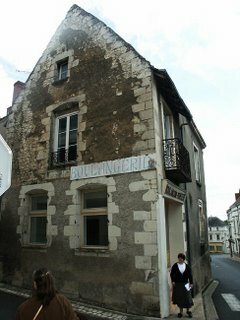 On Monday morning it was back to Preuilly to see a couple more properties, including one arrangement of 3 houses around a courtyard. Most odd, and none of the rooms in any of the houses were of a decent size. Then we were taken (almost as an afterthought) to see a three bedroom house with garage and attached barn which had once been a granary. As soon as I walked in, it felt right. Sure it had a lot of issues, but they were, for the main, visible. The roof obviously needed doing, and there was obviously no kitchen or bathroom (or working toilet), but it had all the space we feel we need. There was even a garden. I loved the way the buiding felt so solid, even with the repairs that needed doing. The walls of the barn almost a metre thick, made out of carved limestone blocks, the encaustic tiles on the floor of the sitting room. We left the agent, promising to be in touch.............and so back to Paris and the Aeroport Charles de Gaulle. Never again!